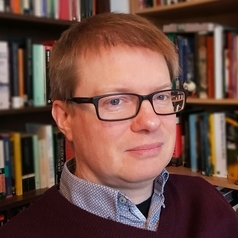 The main focus of his current research is on representations of the Auschwitz Sonderkommando, ranging from the framing of their testimony in post-war trials to novels and films in which they appear as characters to their presence in sub-cultural forms such as comics and extreme metal music. He also researches Holocaust testimony and memorialisation more widely; contemporary Jewish poetry; Anglo-American modernism and antisemitism; and twentieth-century British Jewish literature and culture. He has co-edited (with Fabio A. Durão) Modernist Group Dynamics: The Poetics and Politics of Friendship (Cambridge Scholars, 2008) and (with Nicholas Chare) Representing Auschwitz: At the Margin of Testimony (Palgrave, 2013). Matters of Testimony: Interpreting the Scrolls of Auschwitz, co-authored with Nicholas Chare, will be published by Berghahn in 2015.